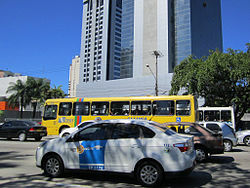 ^ "Recife – IBGE Cidades". IBGE. Retrieved December 14, 2016. ^ "Entrevista com Laurentino Gomes: um mergulho na origem da exclusão social" (in Portuguese). Folha de Pernambuco. Retrieved April 19, 2019. 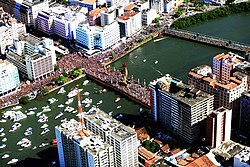 ^ Digital Port of Recife (PDF) (in Portuguese). Recife, Brazil: Porto Digital. 2006. ISBN 85-240-3919-1. Retrieved July 18, 2007. ^ "A feijoada não é invenção brasileira" (in Portuguese). Superinteressante. Retrieved September 19, 2017. ^ "O Carapuceiro (jornal)" (in Portuguese). Fundaj. Retrieved September 19, 2017. ^ Recife Metro (in Portuguese). Recife, Brazil: CBTU. 2006. ISBN 85-240-3919-1. Archived from www.cbtu.gov.br/acbtu/acompanhia/sistemas/rec/recsist_cont.htm the original Check |url= value (help) (PDF) on February 2, 2008. Retrieved July 18, 2007. ^ "Recife Public Transportation Statistics". Global Public Transit Index by Moovit. Retrieved June 19, 2017. Material was copied from this source, which is available under a Creative Commons Attribution 4.0 International License. ^ "Shark Attack Data Brazil". Shark Attack Data. Retrieved December 23, 2017. ^ a b "Tubarão: julho é o mês com mais ataques. Saiba como evitá-los". Jornal do Comércio. July 18, 2016. Retrieved December 23, 2017. ^ a b "The beautiful Brazilian beaches plagued by shark attacks". BBC. September 27, 2012. Retrieved December 23, 2017. ^ "Ataques de tubarão: 25 anos de medo nas praias". 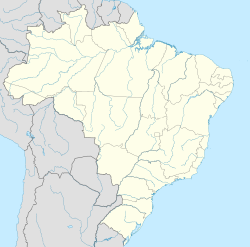 Diário de Pernambuco. November 21, 2017. Retrieved December 24, 2017. ^ "Vinte anos após a proibição de esportes náuticos, governo desiste de instalar tela de proteção". Diário de Pernambuco. March 31, 2015. Retrieved December 24, 2017. ^ "Mayor's International Council Sister Cities Program". Recife, Pernambuco. Archived from the original on July 24, 2008. Retrieved August 18, 2008. ^ "Guangzhou Sister Cities [via WaybackMachine.com]". Guangzhou Foreign Affairs Office. Archived from the original on October 24, 2012. Retrieved July 21, 2013.